References | ROBEX DK, s.r.o. Firm ROBEX DK, s.r.o.® is supplier and producer machinery for processing, refinement textile material, foam material and other material. We allow introduce some firm, which exploited us made machine in this section! We supply our machines and goods for more than 2000 firms. Do you want next references? >> cutting and spreading tables etc. >> complete machine pool - band saw, soft foam recycling line etc. >> spreding machine with heat unit Leister, paspulator etc. >> hand held cutting machines and tools (YJ-65, S-54) etc. 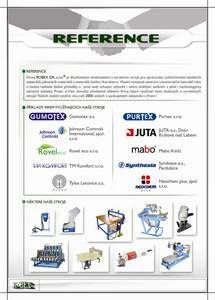 >> machinery for produce from PUR and textile, band saw etc. >> automatic and semiautomatic machine, spreading machine etc. >> spreading and cutting machine, hand held machine etc. >> spreading machine, cutting machine etc. >> rewinding, perch machine, band saw etc. >> band saw, cutting technique rtc. >> band saw, machine for EPE cutting, hand held cutters etc. >> splitting machine, band saw etc.